As a gift to the Nova Scotia Museum on our 150th Anniversary, the Nova Scotia Archives has recently published the Scrapbook of Dr. David Honeyman, the first Curator of the Nova Scotia Museum (1868-1889). The Scrapbook items largely focus on Honeyman's activity as a Commissioner for the International Exhibitions in 1862 through 1867. These events were very significant for Honeyman, a geologist that had been hired by the government to organize and host the exhibits. It was his work at these exhibitions that would lead to his appointment as the first Curator of the new Provincial Museum in 1868. 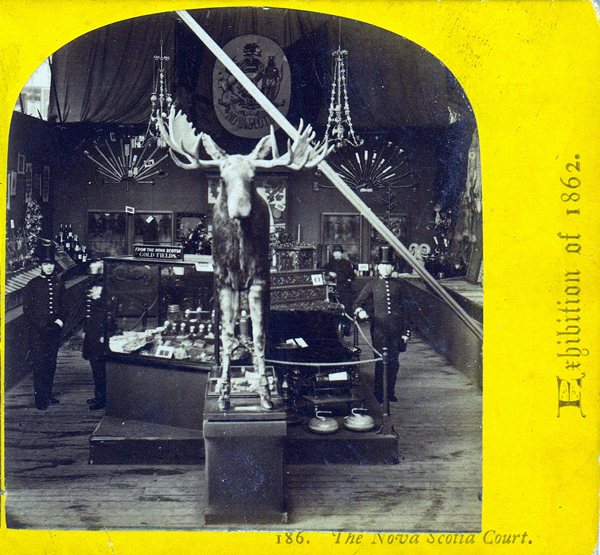 The Honeyman Scrapbook includes several stereoscopic images that show what the Nova Scotia exhibits looked like at the London International Exhibition in 1862. The stereoscopic images conveyed the illustion of three dimentional depth when looked at through special viewers. Imagine how thrilling it would have been in 1862 to observe these scenes in 3D. These images were very high-tech! The Museum has also recently located other images of the 1862 Nova Scotia exhibits. The London Stereographic and Photography Company image (#186) shows the Nova Scotia Court with the Moose front and centre. These images are rich visual records that depict how Nova Scotia was represented at these International Exhibitions. The Nova Scotia Court. The London Exhibition of 1862. London Stereoscopic and Photographic Company. Image from: World of Stereopairs. Researchers from the Nova Scotia Museum continue to study the images from 1862, looking for information about items in the Museum's collection. To find information about specific items in the photo we can look for descriptionspublished in the archived reports written by David Honeymen. We can use these old archived reports to try to determine… where is the moose? In the Report of Nova Scotia Comissioners for International Exhibition 1862, David Honeyman explains that after the London Exhibition finished, some items were offered for sale, some items (like the gold) was set aside for shipping back to Nova Scotia “in one of the earliest spring ships”, and other items were donated to Museums. These archived reports show that David Honeyman had established collaborations with Professor Thomas Croxen Archer, a British Botanist and the first Director of the Industrial Museum of Edinburgh. This would would become the Edinburgh Museum of Science and Art and eventually the National Museum of Scotland. In the report of 1865, David Honeyman makes a point that the specimens “are yet as attractive in appearance” as when they were exhibited in 1862. The specimens had survived at least three years. This is significant in that the preservation of natural history specimens was still improving during this period. There were many museum specimens that did not withstand the test of time, becoming degraded or decaying to become recognizable or no longer useful. We have contacted colleagues and searched the online catalogue at the National Museum of Scotland. So far, we have not found any additional records of what has become of the Nova Scotia Moose. It may indeed have degraded over the years and not survived, or been disposed of over the many years that have passed. If we can find a record, this would be a potentially valuable specimen for DNA reference, as a historical example of Mainland Moose population. Additional research with the National Museum of Scotland @NtlMuseumsScot may provide some additional information as we continue #FindingHoneyman. In the 1865 Report David Honeyman also reported that although Professor Archer had expressed interest in obtaining more Nova Scotia exhibits for his Museum, Nova Scotia decided instead to leave the items on display at the Dublin Exhibition Palace and Gardens for long term display. What happened to those items from 1865 may be discussed in future blog posts. For now.... the moose hunt continues. More about Professor Thomas Croxen Archer.